Fiberglass showers are recognized for their durability, glossy appearance and simple maintenance. However, shower surfaces can become marred with sticky adhesive from non-slip appliqués and stickers. Dirty water, bacteria, and airborne dust particles become trapped in adhesive, causing the sticky residue to become dark and gummy. 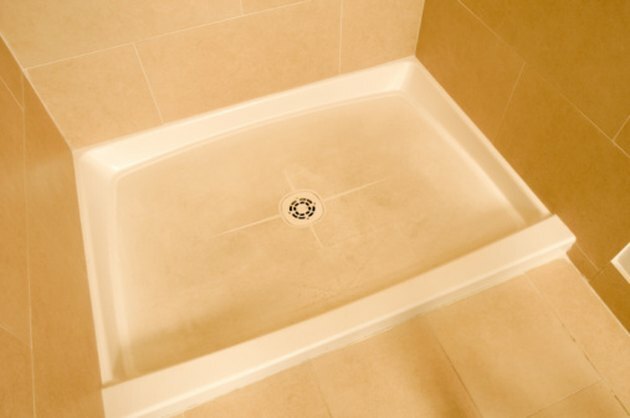 The adhesives cause fiberglass showers to appear dingy and improperly maintained. The longer adhesives remain on fiberglass, the more difficult they are to remove. Fortunately, certain solutions can effectively remove adhesives from fiberglass showers. Adhesives can ruin the appearance of fiberglass shower pans. Scrape off as much adhesive as possible using a plastic scraper. Spray commercial adhesive remover directly onto the remaining adhesive. Follow the manufacturer's directions on the product's label. Normally, you should keep the adhesive remover on the fiberglass surface for 30 minutes to soften the adhesive. Wipe off the adhesive and solution with a paper towel. Thoroughly dry the fiberglass surface with clean paper towels. Inspect the fiberglass for any remaining adhesive. Repeat the cleaning process if traces of adhesive remain. Fill a plastic pail with 1 gallon of warm water. Add 1 tsp. of liquid dish soap to the water. Thoroughly mix the solution. Dampen a nonabrasive sponge in the soapy water. Gently scrub the fiberglass shower surface with the soapy sponge to remove any remaining dirt or residue. Frequently rinse the sponge with water to prevent reapplying grime to the fiberglass. Rinse the fiberglass surface with warm water. Thoroughly dry the fiberglass with a clean terry cloth towel.